Emily Thorne may have thwarted Margaux LeMarchal's attempts to release an incriminating video to the public, but it doesn't look like Margaux's going to roll over and give in. 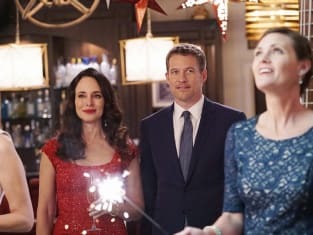 During a Fourth of July celebration on Revenge Season 4 Episode 16, Margaux meets with her private investigator who has acquired dirt on Officer Ben which Margaux plans to use to force him to give up the dirt on Emily Thorne. Her plan will probably backfire. Probably. Elsewhere on the episode, sparks are certainly going to fly. Take a look now to see what we mean. 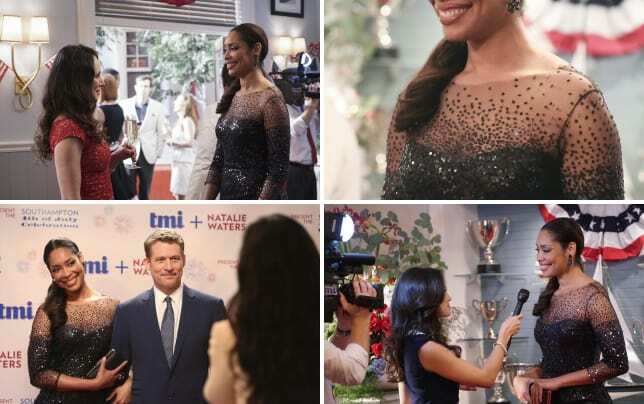 Gina Torres' character Natalie was revealed to be Victoria Grayson's...MOTHER IN LAW. Victoria is none too pleased with the fact that Natalie now controls the remainder of the Grayson family money. Just how will Natalie retaliate for Victoria's little scheme to expose her gold-digging ways to the world? Natalie gave him a yacht and then climbed aboard it to get cozy with Victoria's former flame and when Queen V finds out, she'll probably hit the roof, even though she and David are no longer together. The question is whether David will recognize Natalie's power grab for what it is or fall for her. Here's hoping he plays it smart. Watch Revenge online to find out what's going down in the Hamptons.